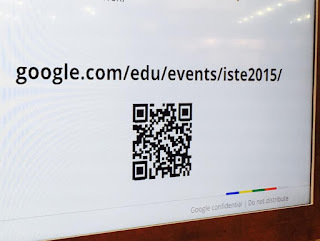 I wasn't able to attend ISTE this year, which was a little disappointing. I did get over it quickly after I joined the #NotAtISTE15 group. I was able to follow lots of the conversations that were going on at ISTE from home. I was even able to participate in not one #NotAtISTE15 Ignite session but three of them. I really enjoy sharing so I was ecstatic when I was able to share. I even was able to have my own badge that I just had to augment. My edtech friends did let me know that they would be very disappointed in me if I had not put an augmented twist to my #NotAtISTE15 badge. If you scan it with the Daqri app you will receive the augmented experience. I really like the Personalize Your Chromebook Experience with Extensions, Tips and Tricks by Molly Schroeder. The Voices from ISTE 2015 with Rory Newcomb on Gamification and Avatars was also very useful. Avatars can be a very powerful tool in the classroom in building self-esteem. Even if you can't be at ISTE you can always count on Jeff Bradbury to broadcast live from ISTE Blogger's Cafe. If you are on social media you can review the hashtags #ISTE2015 and #NotAtISTE15 to find tons of resources. Including the 3 #NotAtISTE15 Ignite sessions I recorded. Not only do you find amazing resources from following the hastags but you will meet some amazing, passionate educators who love to share. Such as Matt Mill @DitchThatTxtbk, Craig Yen ‏@craigyen, Joy Kirr ‏@JoyKirr, and Todd Beard @TeacherBeard. If you can't attend a conference find out what the hashtag is and follow along online. You will receive mounds of resources, information, and meet some amazing people along the way. Until the next conference, un-conference, or workshop let's Connect, Learn, and Share!